Martello House is pretty spectacular. It has two pools, a game room, and a media room to entertain your guests, while being a short drive from all of St. James’ amenities. I love how close it is to Royal Westmoreland Golf Course, which is renowned across the island. 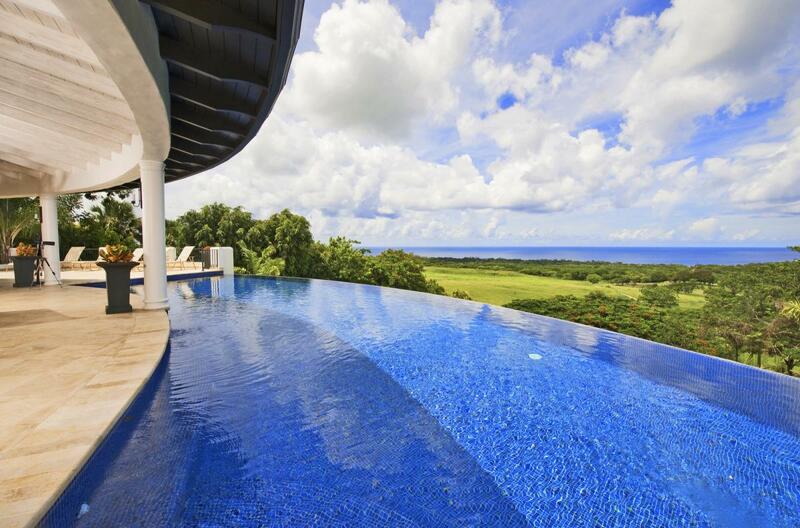 Private villa that overlooks the rolling fairways of the Royal Westmoreland Gold Course. Martello House sits above Royal Westmoreland Golf Course in Saint James Parish, and enjoys panoramic sea views. Full bookings include chef and butler services, while bookings of at least six bedrooms include cook service. The curved infinity pool and lounge area create a unique space for guests to dive into, and no one will feel crammed with a second plunge pool on the lower terrace. Outdoor living and dining spaces blends seamlessly with the indoor living room. Stairs on either side of this room each lead to a bedroom. This level also features the media room, kitchen and dining room, and an additional guest room. The villa’s upper level has a fitness room and game room. Each of the villa’s eight bedrooms has an ensuite bath. Four bedrooms have queen beds, and two bedrooms each have two twin beds. One of the master suites has a king-sized bed and balcony, and the other has a queen-sized bed and ocean views. Martello House is set back from the main road, and only a 5-minute drive from the nearest golf course, spa, and gym. Villa guests are also welcome at Fairmont Royal Pavilion Hotel’s beach.